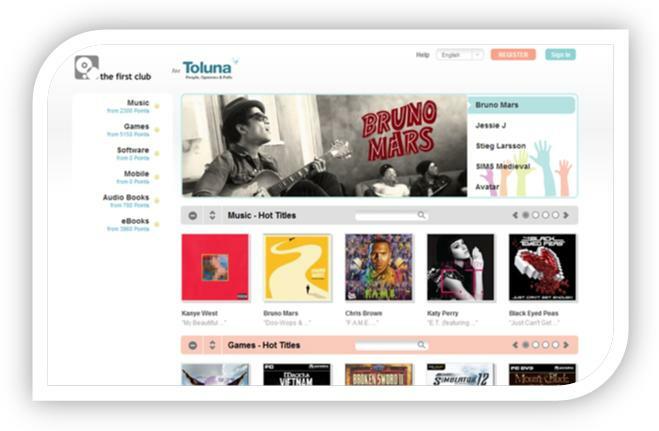 Toluna is proud to be stepping up its collaboration with The First Club™, with the launch of the Toluna Download Store, a dedicated digital portal. For the past few years, many Toluna members have used their points to download music tracks, mobile phone apps, games, eBooks and more from The First Club™. The new website has been created for you, the Toluna member, to make things even easier and to give you access to over 35 million digital downloads. You will not need to create a new account on toluna.thefirstclub.com if you already have one on thefirstclub.com. The information from your The First Club account (both personal data and the balance of your account) will be transferred to the toluna.thefirstclub.com website. To access, please click here. The prices of all items have been lowered so that your toluna points give you even more premium digital content. Overall, it is a fantastic option to use your Toluna points and to get your hands on chart-topping digital entertainment!